I had no intention of playing cricket. When I was 20, I was in the army, posted as the sports officer at the base transit depot in the Suez. I was ranked captain, had three pips on my shoulder, and all I did was play sport. I had decided I was going to sign on as a regular in the army. My brother was playing at Gloucestershire and I played a few games when I was on leave. Charlie Barnett asked me what I was going to do and I told him I was going to continue in the army. He said it was a pity as they thought I could become a cricketer. I was the 12th man for Gloucestershire against the Australians in my first season. They won the toss in Bristol. I tapped on their door and said to Lindsay Hassett, "The Gloucester boys are on the field." [Arthur] Morris and [Sidney] Barnes stood up and as they went to the door, Hassett said to them, "We don't want [to get out to] this fellow [Tom] Goddard". Goddard was a good offspinner, and he had taken 238 wickets in the season. He had hands like a bunch of bananas. At quarter to four in the afternoon on the first day, I was the fielding substitute for Goddard, who had bowled 32 overs, taking nought for 186. Those Aussies had sorted him out. We were honest about the game. That doesn't happen anymore. It has got tougher, tighter, more professional. It doesn't matter how fit you are; in fact, you can be over-fit. Cricket is a game of lasting - players train to run in the derby but they are in the Grand National; they have distance to go. You can teach anybody anything, but the one thing a batsman needs to do on his own is pick the length of the ball. That is the secret of batting. Helmets give you a false sense of security. I remember tying a handkerchief to my forehead to stop the sweat from dripping into the eyes. We would never take our eyes off the ball. Neville Cardus wrote about me when I got my 100th hundred. He said if everything disappeared from this earth with only me left, he could reconstruct the game [from] the way I behaved and the way I played. That was an enormous thing to say. I guess he went a bit over the top. 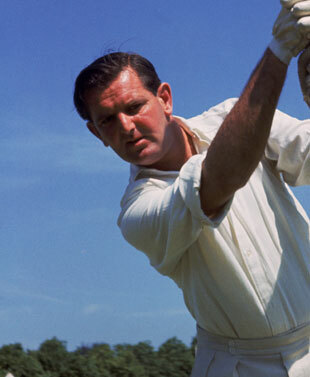 Frank Tyson was the fastest bowler I ever faced. But the nastiest pair I ever faced was [Peter] Heine and [Neil] Adcock in the 1955 series. [Len] Hutton had retired and I, unfortunately, got the opening spot. Heine didn't want to hit the stumps, he wanted to hit you. Not very friendly. The best bowler I faced was Raymond Russell Lindwall, who destroyed us in 1948. If you look at his record, Andrew Flintoff is not great. His batting average is not great, his bowling average is not great. But he was a great talisman, a great team man. That was his real ability - he got people going. In my day, five people did not walk, and everybody knew who those five were. Now it is the other way round: there are five who walk, the rest just hang around. Nineteen sixty-nine was my benefit year. It was the first year of the Sunday League and a sponsor had offered me ₤1000 to play. In those days we were serfs; we didn't get paid. I was 42 and couldn't afford not to have that money. 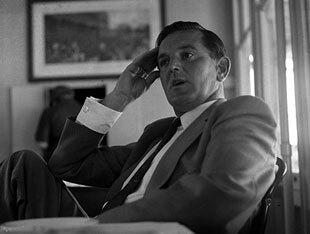 Before the Test, I rang Alec Bedser, then chairman of selectors, who said I couldn't play the benefit. My final words to him were, "Don't pick me for the Test". But at lunchtime on Sunday I heard on the radio I was in the team. I went on and played the game against Bobby Simpson and Richie Benaud, had a good day and got the ₤1000. I was reported to the disciplinary committee and got banned for three games. At 42, I wasn't going to play much more. In those days we didn't have agents or solicitors looking after us. But I got 75 in my last Test innings. There is nobody who holds the bat the way I did. The top hand now is at the bottom. Mine was on the top and the bat was just a pendulum. My favourite shot was the cover drive. I was very much a front-foot player and I even hooked on the front foot. It is a skill given to you. It is like a gift if you use it. Michael Vaughan, in recent years, had a wonderful cover drive, but Wally Hammond's was the best. It always worried me if I started too well, but sometimes you just start middling it and it flows. I had a very chequered Test career. I had two three-year gaps. The second was silly. I thought I was the best batsman in the country when I was playing for Worcestershire between 1963 and 1966. I just didn't get picked. And then to be brought back after my 39th birthday was a bit ridiculous. I was proud to be appointed the first professional to be president of MCC, an enormous honour. In the match in which I became the 15th batsman to 100 first-class hundreds, when I was on 99, Keith Andrew said from behind the stumps, "You don't want us to give it to you, do you?" I would have loved to have said yes. David Larter had bowled a very good over and ended it with a bouncer, which I went to pull only to get a bottom edge. It bounced over short leg and I ran a quick single. It was a different game in those days and sometimes you did someone a favour. Keith Miller once did me a favour when I opened with Hutton in Australia. After I got to 85, I drove him for three fours and then he bowled a slow long hop down leg side after I had missed a similar one the previous ball, to get me to the hundred. He was a great man, a great friend. I was good at golf. Single figures for 57 years. My best performance was when I played in the pro-celebrity tournament at Turnbury. My partner was Johnny Miller, the American golfer, while Nick Faldo's partner was Henry Cooper. We played nine holes and I was the smallest by a long way at the first tee. I played out of my skin. We only won on the last green. If you are a good enough player at 40, you should be playing. Today there is too much messing about on the field. Why do we have drinks? Can't they last two hours? They also tinker with the field all the time. You should know what you are up to when you go on the field. Another thing is gathering around and giving each other kisses and high-fives. Cricket is not about that, at least it never used to be. Even if the intensity was the same, we didn't string our arms around each other. Beer was our staple diet. Cricket made us see the unthinkable, too. We were part of Ron Roberts' Cavaliers. We were driving from Bulawayo up to Salisbury and Everton Weekes, Ray Lindwall, Roberts and I went to a bar. We ordered four gin tonics. Some slob of a woman behind the bar said to Weekes, "You, get out you. You are not allowed here". We marched out and told her what to do with her gin and tonic. It was a coloured bar. A similar incident happened with Sonny Ramadhin when they refused to cut his hair in Rhodesia. It was terrible. Thank goodness, it has improved. Rhodesia was a beautiful country, now it is wrecked. . I don't know if I gave anything back to the game but I played fair all my life and never forgot that it is just a game. It gets serious at times. The one thing you have to do is enjoy it.